I was thinking about this little film I made around the release of Charlie Musselwhite‘s album ‘Sanctuary’ on Real World Records the other day and realised that today would mark ten years since we filmed the concert at Joe’s Pub in New York. February 25th 2004 was a special night for many reasons, not least that Charlie Musselwhite is always entertaining and had put together a great band, with Charlie Sexton, Jared Nickerson and Michael Jerome. Another reason it stands out is that Hillman Curtis, who I had met when we were both speaking at the GRAFILL edit conference in Geilo, Norway, the year before had agreed to come along and help me out with the filming. I seem to remember that Hillman had just acquired a new Panasonic camera and was, with hindsight, at the beginning of a journey that would take him on to make some really great films. If you look him up you can see much of what he made. Hillman was a lovely man and something of a serial achiever, but sadly he died a couple of years ago, so that night in New York was the last time I saw him. The blues of Mr Musselwhite are then particularly apposite. A short piece about the importance to me of this photograph, taken on an inspirational walk around Wimbledon in the late 70’s with my father William Tillyer, also pictured, appeared in The Guardian today. Happy as I am with the publication, its purpose intact, publicity for my fathers exhibition ‘Against Nature’ at mima, I’m sure I didn’t write “The day my Dad taught me to see more”. More? As someone who spends a lot of time editing others, it’s curious to be subject to the process yourself. What I actually wrote, cribbing John Berger’s title “Ways of Seeing” is below. Thanks to all involved, and to hammer home the mima point, I’ve posted film I made to run at the exhibition. It’s 1979, my father has taken me out to shoot a roll of film on his Olympus OM-1. This isn’t my first photograph, the earliest I possess pictures my parents and sister at the side of our Buick Estate-Wagon; taken on a Polaroid my father had borrowed from the Art Department for a trip down the East coast of the U.S.A during his year as visiting Professor at Brown University. 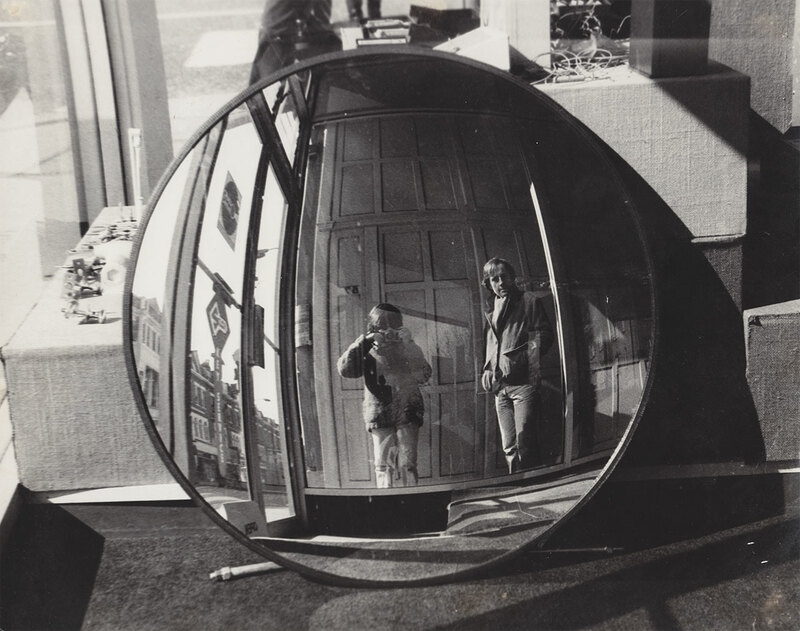 This image of us reflected in a security mirror on display in a Wimbledon shop window stands out because I learnt something that day about ways of seeing. It was exciting to use the camera, always an object of fascination, but what stays with me is that my father showed me how to look beyond the obvious - the few mistreated negatives I still have from that day show us reflected in windows, mirrors, puddles – captured obliquely as we explored an idea in a series of images. My parents met at Art College in their hometown of Middlesbrough and their interest in all things visual was at the core of our lives. My sister was more open to expressing herself through drawing and painting, but for me it was the medium of technology that allowed this freedom. We had driven around the North York Moors National Park whilst my father photographed the now vanished ‘Milk Stands’ of his ‘Furnished Landscape’ project, my mother had disappeared into her darkroom at home in London to emerge with images of our childhood, and I’d marveled at the melted wires in the disposable flash cubes of my grandparents Kodak Instamatics, but it was on this walk around Wimbledon that something first clicked for me. Holidays were loosely disguised painting trips, with everything from hotel rooms in Verona to Swedish barns and Florida motels transformed into studios around us. At exhibition openings, where small children could be easily ignored, my sister and I would enjoy hearing the occasionally bemused comments of people looking into our world – What was that graduated grid of blue supposed to be? Why was there a cloud in that box? There was always inspiration sought, and work sparked by our environment, yet it was back home on that walk around Wimbledon that I first understood the difference between simply recording and actively looking. The walk paid off as I now make my living as a photographer and filmmaker at Peter Gabriel’s Real World Studios where the link between technology and creativity has continued to allow me to develop my work. Occasionally I’ve been able to collaborate with my father who continues his search for the perfect painting. We recently worked together on a digital manipulation of his watercolour to create the 9 meter tall print, ‘High Force’, that greets visitors to his retrospective ‘Against Nature’ at mima. Walking around that show, or his current exhibition ‘The Watering Place’ at The Bernard Jacobson Gallery in London I’m still as surprised and inspired by what I see as I was on that Wimbledon walk.